Plants herbaceous or shrubby, with compound flowers (of the old botanists) i. e., (he flowers in dense heads (capitula) surrounded by an involucre of many bracts (scales), with 5 united anthers and the fruit an achenium (cypsela). Leaves alternate or opposite, exstipulats, simple, yet often much divided. Fls. (florets) ∞, crowded, sessile, on the receptacle with or without pales (chaff). Cal. adherent, the limb wanting or divided into bristles, hairs, etc. (pappus). Cor. tubular, of 5 lobes with a marginal vein, often ligulate or bilabiate. Stam. 5, alternate with the lobes of the corolla, anthers cohering into a tube. Ov. 1-celled, with 1 erect ovule; style single with 2 stigmas at summit. Fr. a cypsela (§ 557), dry, indehiscent, 1-seeded, often crowned with a pappus. Illustrated in fists. 55. 118. 141. 142, 145, 146, 170, 192, 19-3, 211, 212, 213, 214, 215, 324, 328, 329, 330, 331, 332, 333, 364, 379, 416, 434. Genera 1000 or more, species 9000? the most extensive and the most natural of all the Phaen-gamous Orders, always distinguished at sight by the capitate flowers and the united anthers. It comprehends nearly one-ninth of all the species of flowering plants. The general inflorescence is centrifugal, that is. the central or terminal heads are first developed, while the inflorescence of the heads is centripetal, the outer flowers first expanding. In color the flowers are various; sometimes those of the disk and ray are of different colors, again they are all of the the same, but in the former case the disk florets are almost always yellow. This immense order is diffused throughout all countries of the globe, but in very different proportions. According to Humbolt, they constitute about one-seventh of the Phtenogamous Flora of Germany, one-eighth, of France, one-fifteenth, of Lapland, one-sixth, of North Amcriea (north of Mexico), and one-half, of Tropical America. In New Holland they are in the proportion of about one-sixteenth, according to Brown, while in the island of Sicily they are one-half. The Liguliflora3 are said to be most abundant in cold regions, and the Tubuliflorae it hot regions. The Labiatiflorae are almost exclusively confined to South America. In the northern parts of the world the Compositae are universally herbaceous, but towards the tropics they gradually become frutescent and even trees. In Chili they are generally shrubs, and on the island of St. Helena they are trees. Properties, etc - The Composite furnish comparatively few useful products. A bitter principle pervades the whole, which, when combined with resin and astringent mucilage, becomes tonic and febrifugal, as in the chamomile, colt's-foot, thorough wort golden rod, etc. 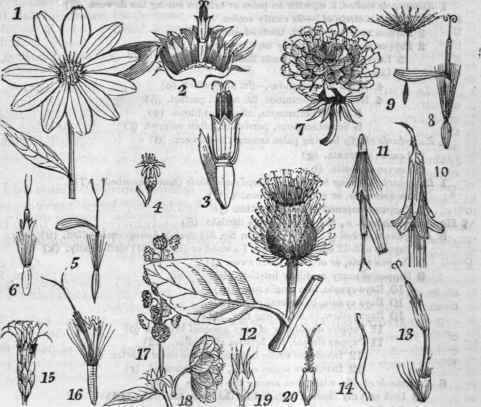 Some are anthelmintics from the prevalence of the resinous principle, as tansey, Artemisia, Vernonin, Others are aromatic and extremely bitter, as wormwood and all the species of Artemisia. Other species are very acrid, as mayweed. The Jerusalem artichoke (Helianthus tuberosus) the vegetable oyster (Tragopogon), the true artichoke (Cynara), lettuce, dandelion and a few others, are the only species useful for food. The order abounds in ornamental plants. 641, bis. 1. Helianthus head radiate. 2. Vertical section of the head, showing the scales of the involucre and a single disk-flower remaining upon the convex receptacle, 3. A perfect disk-flower showing every part. 4. Head (radiate) of Solidago. 5. A pistillate, ligulate flower of the ray. 6. A perfect disk fl. 7. A (radiant) head of Taraxacum,8. A perfect, ligulate fl. 9. Aciienium, with its long beak and plumous pappus. 10. A (radiant) head of Nabalus altissimus. 11. A flower. 12. Lappa major, head discoid. 13. A flower. 14. One of the hooked scales. 15. A (discoid) head of Eupatorinm purpurcum. 16. A flower. 17. Ambrosia (Pigweed). 18. Staminate head enlarged. 19. Pistillate involucre enlarged. £0. The fertile flower.